Last week I was lamenting about my lack of inspiration and the overwhelming amount of fabric scraps I seem to have collected. I thank you all for your supportive comments and good suggestions. A couple of the comments mentioned cutting up all the scraps into squares, but honestly I didn’t have the energy to do that. There was just WAY too much. 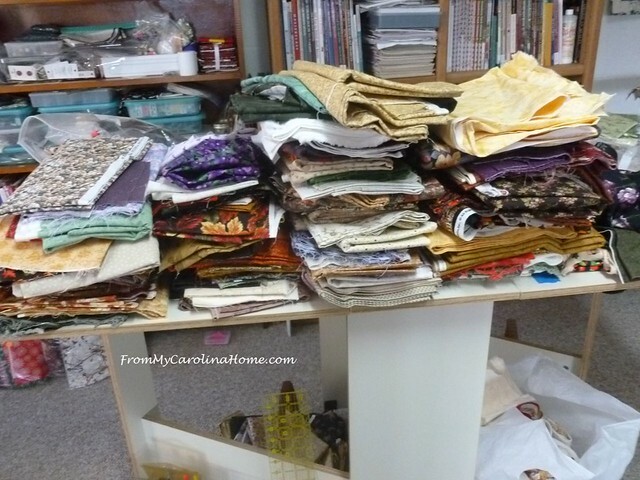 Still, I do a clean out project every January, so why not make my scrap pile the focus of this year’s effort. 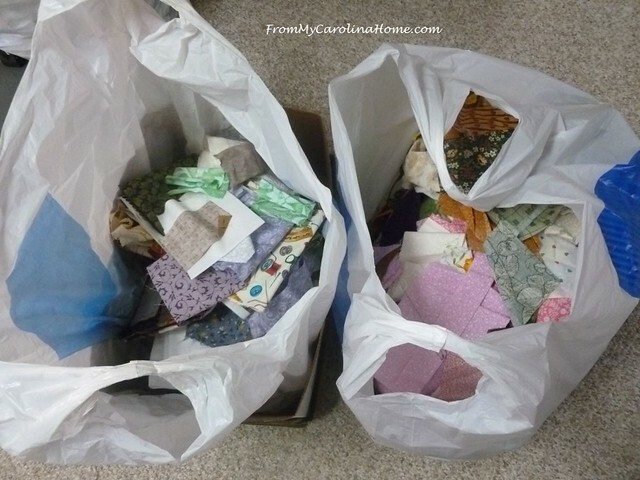 So, when I began, I had 17 of these two gallon zip top bags full of small pieces, leftover charms and jelly roll strips, cut bits from previous projects…. and a tower of baskets completely stuffed with more leftovers. 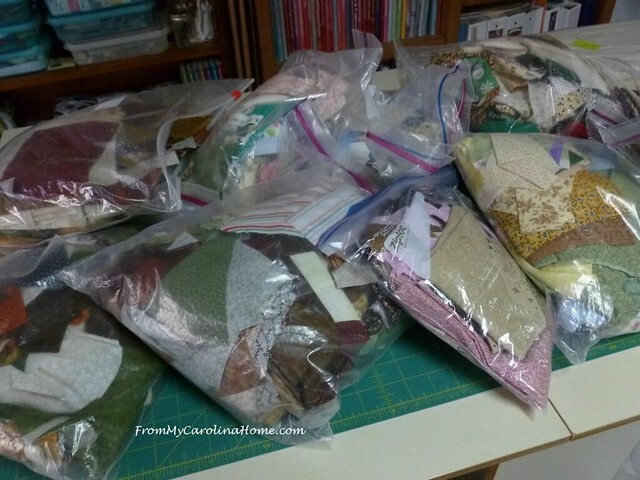 I unloaded all those zip top bags onto the cutting table, one at a time and began bagging up the smaller pieces, leftover squares and strips, and pieces less than a fat quarter in size. These bags will go to the local guild for their grab bag fundraiser. placing all those pieces on the cutting table to go through. Some were small bits that went into the scrap bags. I looked at every single larger piece and asked myself if I really liked it for its own sake, or did I have it because it was given to me or picked up off a free table. So the scrap bags got a bit fuller. 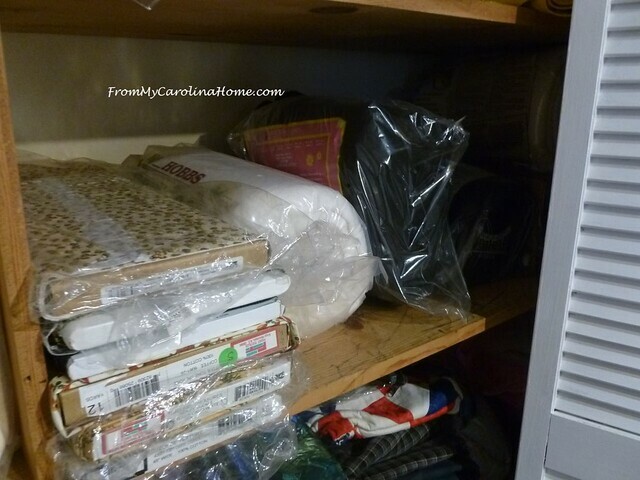 The closet also was emptied, and the fabrics given the same likeability test. When I was done emptying all the zip top bags, I had space on a shelf for the Asian collection. Yes, every one of those passed my test, LOL!! 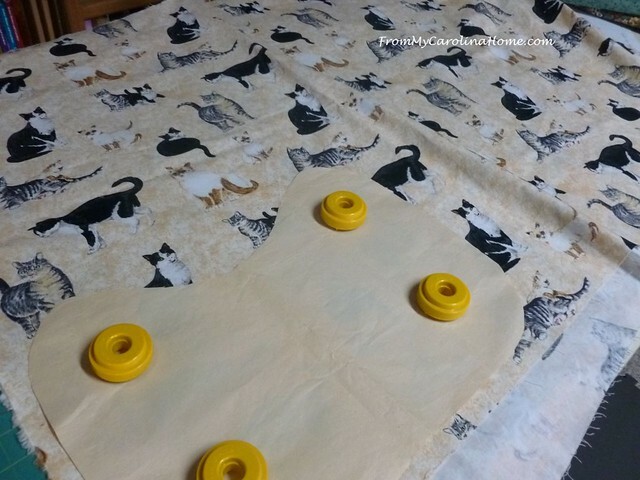 I kept three zip top bags with bits – one with the blues and yellows for which I have a quilt planned, one with sewing theme fabrics just to keep them together, and one with white background yardages. The one in the back of the closet has a blouse cut out that I lost interest in making. But it is cute, so I’ll decide about it later. Batting pieces large enough for lullaby quilts or table toppers were, measured, labeled, refolded and stacked in one spot. Removing the not-so-loved fabrics still on bolts freed up more space, as some of those bolts had less than a yard of a fabric. Unopened batting was moved around to sort by size – mostly I have queen and full size battings. 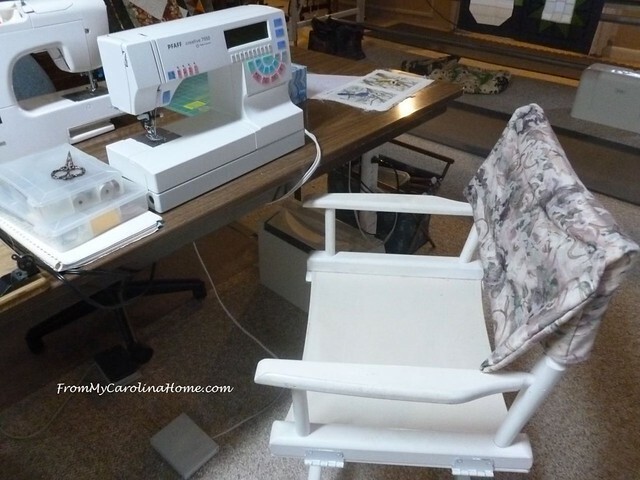 Now the director chair is back in front of the Pfaff again, so I can have a place for a friend to sit and use the machine while I sew on the Brother. 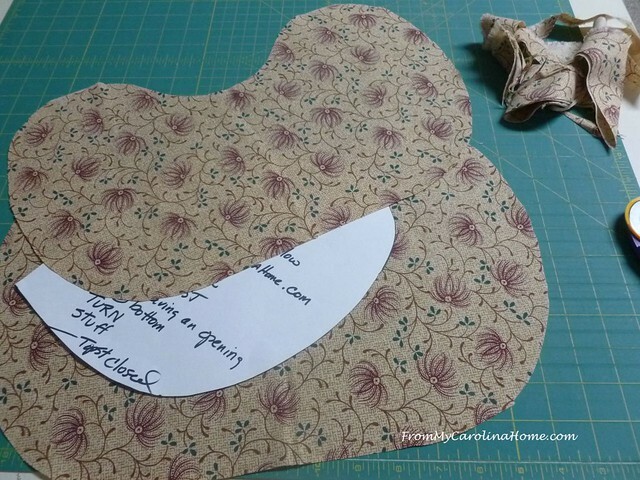 From some of the not-so-loved fabric leftovers, I began cutting out Comfort Pillows. 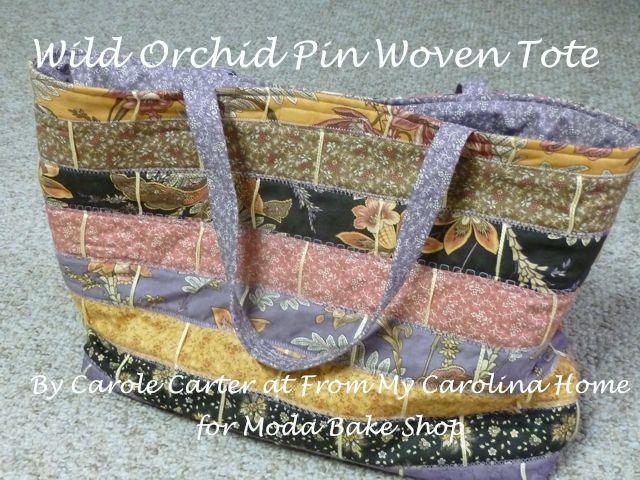 Click on that link for my post on making these and the free pattern. Two pieces cut for each one. Those scraps were used as stuffing. Where this cat fabric came from is a mystery, perhaps from the one friend that has two cats, but I don’t remember her giving it to me. Under the cutting table was this huge bag of clippings too small to do anything with, along with batting scraps, and trimmings from quilting. All of this became stuffing. Since I cannot do the dog beds, I figured Comfort Pillows would be a good place to use it. I cut out 10 to fill right away, plus more to keep under the cutting table to fill with scraps as I go. Although fabric scraps by themselves are not that great for stuffing, with the batting scraps thrown in and a bit of fiberfill, the pillows are quite comfortable and soft. 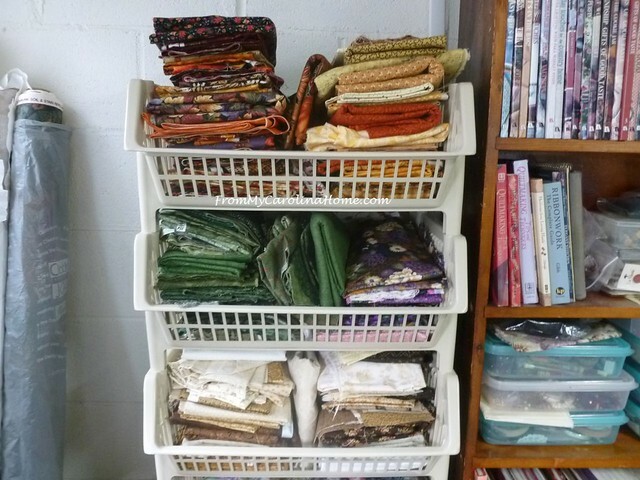 I organized the fabrics I am keeping by color, stacking them neatly in the basket tower. That just feels better! The corner is now clear, the chair can be used again, the bags will be on their way soon, and the comfort pillows were delivered. Shelving is neat and tidy, closet organized, and I can breathe in here again. Are you cleaning out this month? 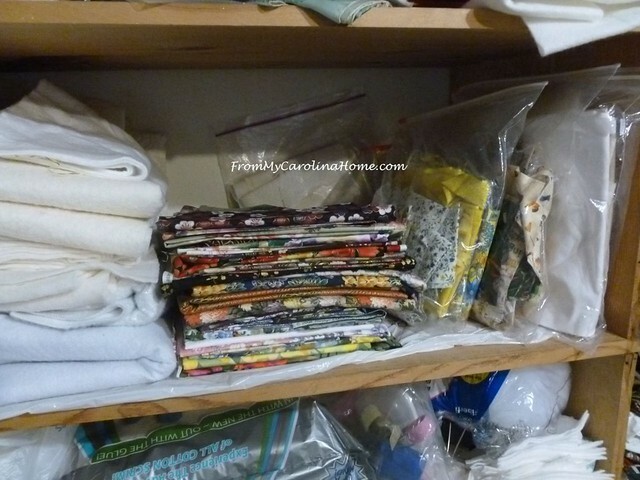 If you are in the mood to tackle a clear out project, I’ve also done posts in previous years on making sense of Getting Organized with Saving Recipes, and What’s in Your Closet? 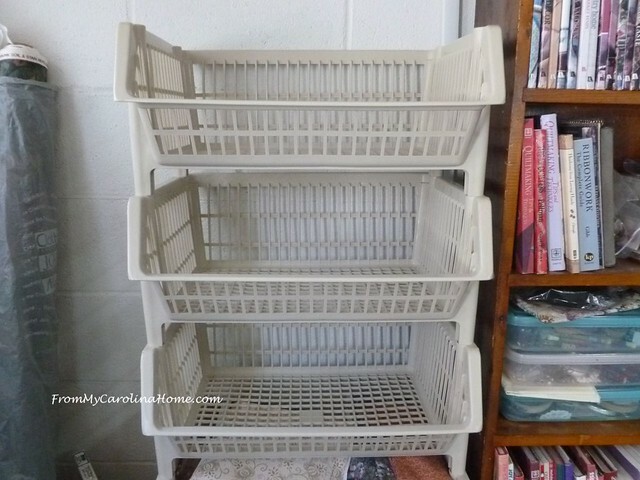 on how to organize your clothes and find what really works. Back to the drawing board, I have been playing around with design on a new quilt for a mystery. I have something that is looking nice in just two colors, but it doesn’t hold up to a scrappy coloration. The secondary pattern gets lost. So, I need to keep working on it for a bit. I hope next month I’ll have something for you, so bear with me! 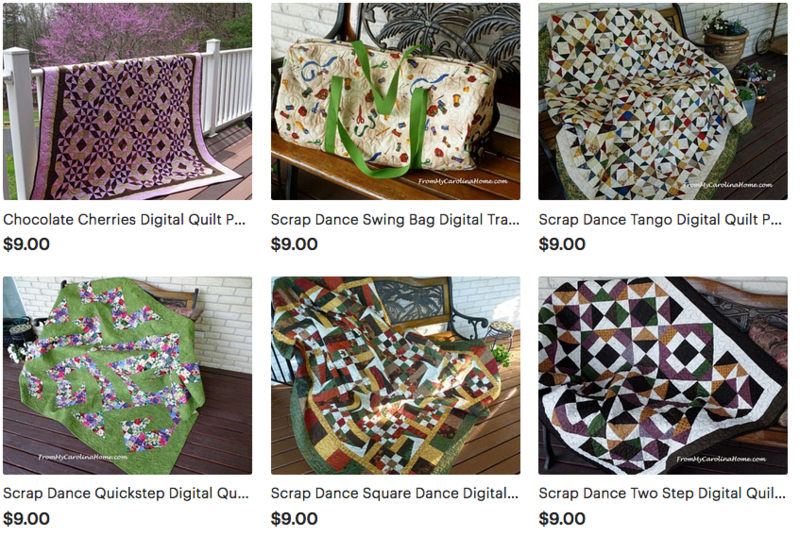 In the meantime, my patterns that were deleted from Craftsy are now available on Etsy – click on Craftnut’s Studio Patterns! An extraordinary effort and fantastic accomplishment! Sorting, sharing, repurposing. I think I need a nap just reading about it. But I might need to make a comfort pillow first. Thanks for the link. I am so glad I don’t live near you. I would be tempted to take that stuff off your hands for you and I don’t need any fabric or scraps! LOL Thanks for the tip about the batting strips. It never crossed my mind to use them for stuffing small pillows and such. I just hate throwing anything away, but I have been throwing those strips away. You should feel very successful. SO much inspiration! Thanks for the cleaning tips! You are inspiring me to do this! Carole, I was tired just reading your post this morning. It’s amazing how we come across fabric that we have no recollection of where it came from, or, ‘what ever possessed me to buy this ugly looking print’ type of fabric. I know there are quite a few of those lurking in the stacks of material sitting on the metal shelving units in our basement, I just need an infusion of get going, and get it done juice in my veins. lol I’m sure your quilt clubs will appreciate your cast offs and put them to good use. You have some great ideas here! I need to go through my “extra” and “left over” fabrics and either do something with them or give them to someone who could use them. I also have an overload of food magazines, cookbooks, and quilting magazines. I could “almost” be called a hoarder. Thanks for the inspiration to tackle some of these things in my house. Wow! You have done a pile of work, how long did that take? I have been putting off cleaning my sewing room for many months now, it’s so overwhelming that I don’t know where to start. But you have encouraged me to give it another try! I never thought of taking before and after photos, maybe that would help! I’m trying to do a whole house purge this year….one room at a time. I’m not ready to attach my fabric stash yet but I will be making some of those comfort pillows this week. 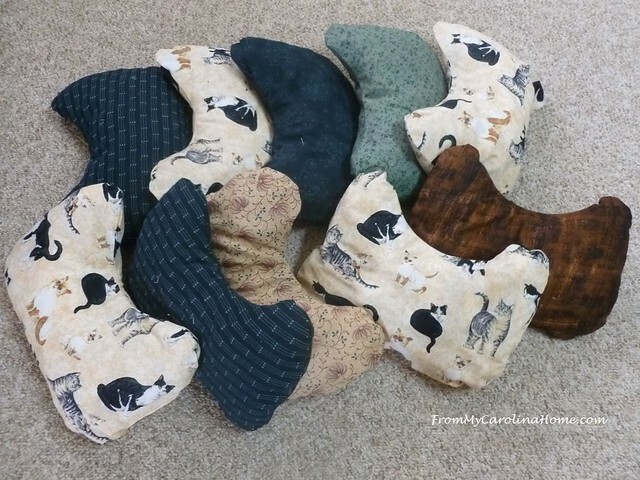 I have a couple of friends who are having heart surgeries this month and my hubby is having thyroid surgery next week.It has been suggested that he has a neck pillow for the first week and I’d rather make one than buy one. I’m the regular comfort pillows first and then determine what adjustments I need to make for the neck pillow to fit him. 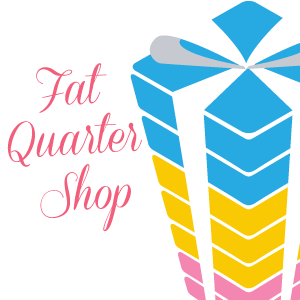 I always tell quilters – do the 5 year touch. If you don’t think you will use it in 5 yrs., let it go. These are women who have 40+yrs worth of hoard.! Our guild has a free table set up each meeting and this is how we let go – what members don’t adopt we pass on to the church sewing group. Awesome clean out! Where are the comfort pillows headed? That’s a great way to use those scraps! I love the idea of using small bits of fabric and batting to fill pillows along with fiber fill. I just took one apart that needs new filling, and this will be perfect! Congratulations on that superb clean out! I get paralyzed when there is too much clutter, so I understand the wonderful relief when things are purged, organized and order is restored! I admire you for such a great job of cleaning up your sewing space and for all you do for charities! I am still looking for something or someone to encourage me and boost my energy enough to get started on my space. I will gleefully let you know when this happens. Curious why you can’t make dog beds? I’ve been saving scraps of everything in the hopes of making some pads or beds. Are there specific rules for them ? Every shelter has its own rules, check with your local shelter to see what they will accept. Our local shelter will no longer take beds stuffed with anything that the dog could ingest or choke on. Wow! Big job but you had a good system. You answered my question about using the scraps for filling.I thought it would be a good idea to mix some polyfil in there and you did! I was getting tired of buying a new bed pillow too often. Mine always go flat in the middle. I had a bag of shredded foam that was kicking around in the closet. I unstuffed my too flat pillow, ripped up that stuffing, spread it out on a table and sprinkled it with shredded foam. Then grabbed it by the handfuls and restuffed my bed pillow. It is better than anything I can buy! So comfortable . . . so far. Until that foam breaks down. But I saved myself a little money! 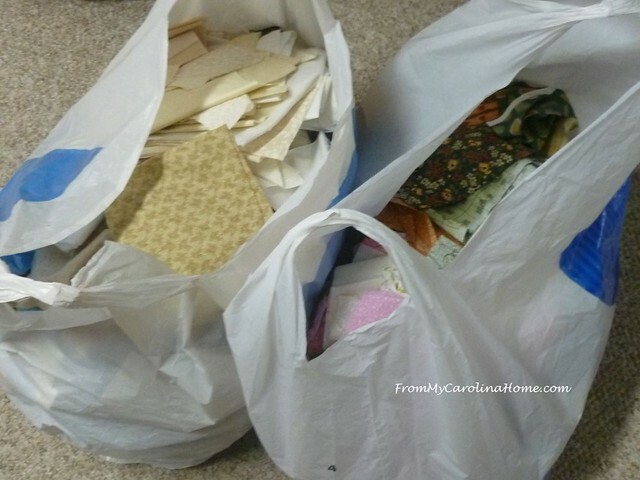 Hello Carole, Such a great job you did on cleaning out the scraps and organizing the ones that you decided to keep. 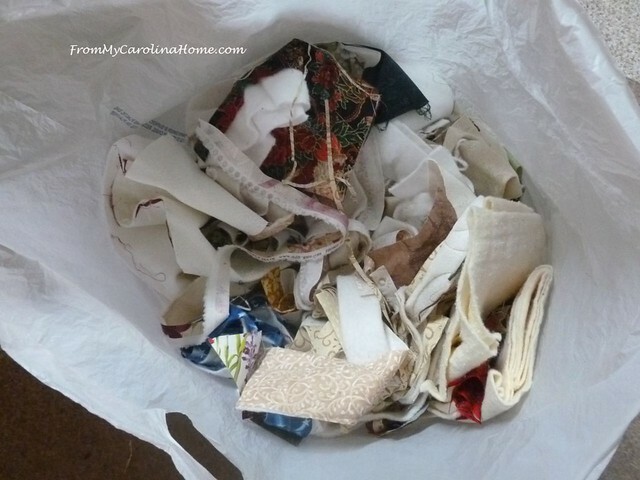 Plus, creating the pillows is an excellent idea to use batting scraps and bits of scraps in. You were busy and the end results are fabulous! Thank you for sharing and have a great day! Hooray for a super clean out! Totally agree that we need to do this every so often, to move along fabrics that don’t inspire, and to move out the small stuff. Congrats to breathing room! Hats off to you! Well done! Check out Bonnie Hunter’s website. 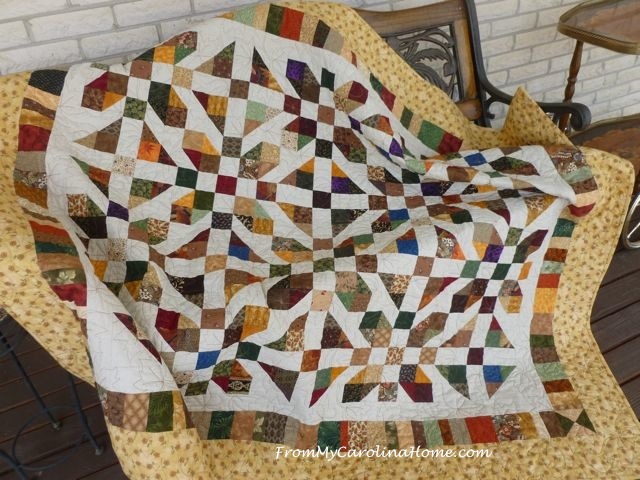 She uses nothing but scraps in her quilts. It might give you some ideas on what to do with your scraps—making crumbs, strings, etc. Yes, I am well aware of Bonnie’s system, but I had just too much to cut up all at once, as I mentioned in the first paragraph of the post. Sometimes you just have to get rid of everything and start over. 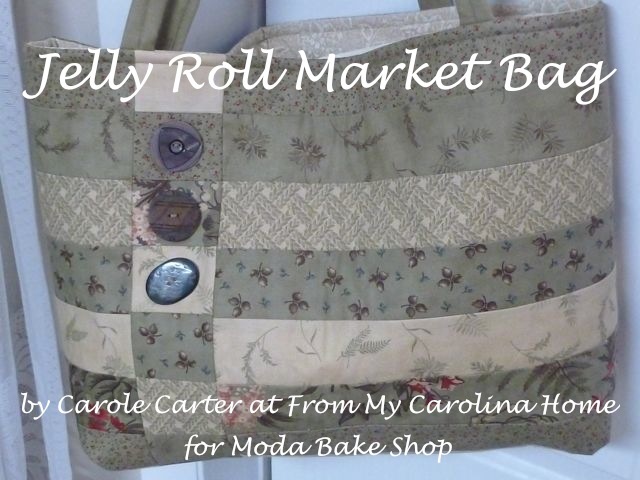 Good job Carole! Don’t you love the feeling you’ve earned now that you’re done? My goal is to purge the garage, half of which I use for storing all my decor stuff, but it’s simply been too cold. I did take a car load to the Salvation Army after Christmas, so at least I started! 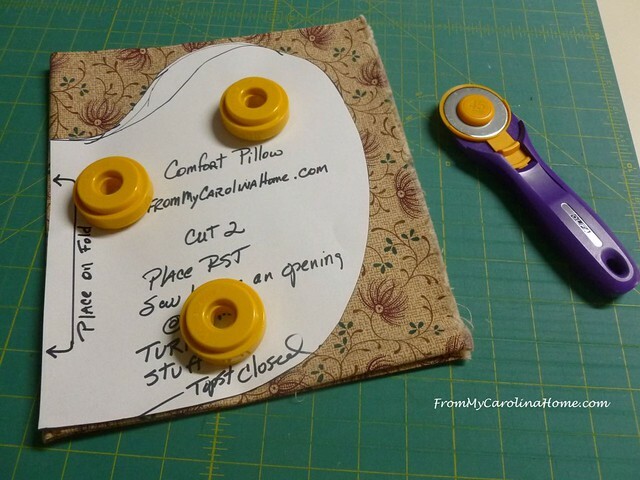 Your comfort pillows are such a thoughtful think to make and give! Good for you for your self-discipline and ambition to tackle this job. I need to do this same (huge) job after getting new carpeting and everything needed to be boxed up. Ugh! 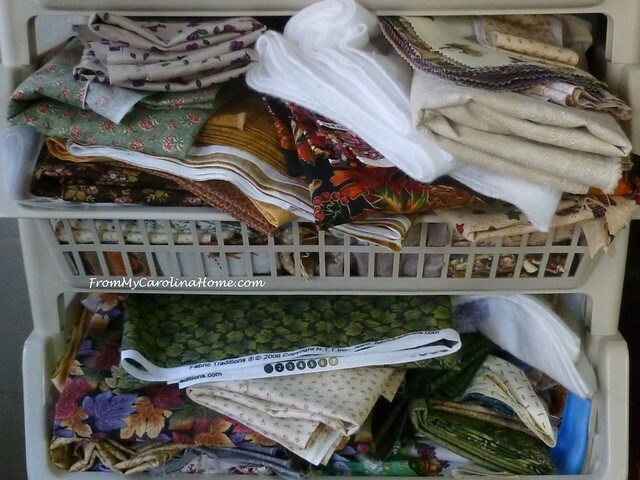 I’d much rather sew than re-organize, as i;m sure you can imagine, Maybe if I could just work for a few hours a time…then reward with a small sew…Oh, the games I play! Haha. While I should do a major fabric sort and purge, we left for TX in mid-January and I spent the first two weeks of the year prepping small projects to take with. That means I’ll be trying to tackle the job when I get home, just as the garden season prep begins. I do try to cut down project leftovers into usable sizes, but I don’t have one of the cutting machines and it takes so much time doing it with the rotary cutter. Plus I wind up with so many cut up pieces that storing them becomes a challenge. So you get a gold star for your re-organizing, purging efforts. Fantastic clean out. I agree with giving away the ones that we do not love any more as we are never going to use them. I have had a lot of fabric given to me by well meaning people and it has just sat there. I finally packed it all up and donated it. Better to give it to someone who wants it. I am sure you feel great after this big sort out! i’m cleaning out under my master bath sinks. I did half the closet a few weeks ago and need a change of product handling. I’m making string quilts to use up my scraps and i am still making 1″ and 1.5″ log cabins to use my pretty strips. 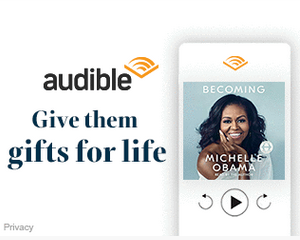 I’m not sure i’d want everything out at once, I’d get overwhelmed. Oh those scraps. I try to organize mine, kinda, lol. They can come in handy sometimes. Wow!! That looks so great – and you are all inspired now! Great job. Great idea for the pillows. I am so overwhelmed. I moved my mother and some of her stash in and lost my space. Now I have it back and I am overwhelmed and can’t get to my machine. You’ve inspired. 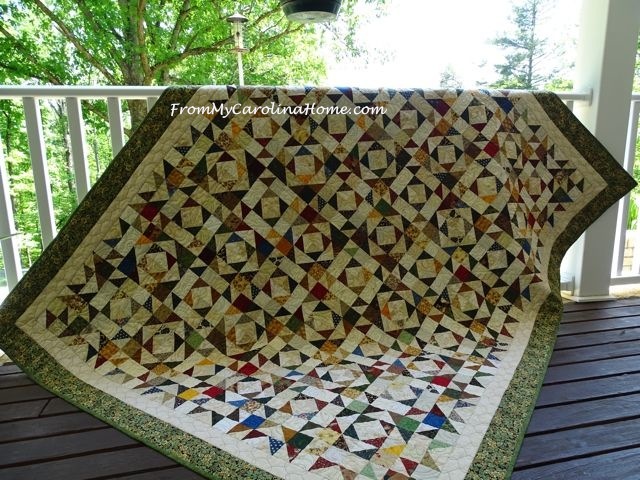 I cam by looking for a sew/quilt along I googled and found you. It sounds as if your clear-out was successful. There is something so satisfying about getting those kind of jobs done.